I got this press release today from a Russian PR firm about a $50,000 school robot that can detect weapons and by the end of the year will be able to see them even if they’re concealed. There’s even a picture of a happy little robot with a student who’s not been shot. The press release raises more questions than it answers, but it was interesting enough to pass along. Intellitronix, a US-based LED vehicle gauge manufacturer, has evidently turned their development efforts toward weapons detections in school that are run by an easy to vandalize robot. You can see their promo video by tapping/clicking here. The robot portion appears to be manufactured by a Russian company called Promobot. I’m going to include the press release below, you can see the translation oddity. There doesn’t really seem to be any reason listed that this has to be in a robot as opposed to some sort of entry-point detection unit or a security guard holding a detection device. Additionally doesn’t appear to be any reason the detection requires a $50K investment. Still, if we could detect weapons at schools with AI and IR, or even detect a five pound magnetic object like a gun, looks like available technology is finally being aimed at solving an issue. Now if they’d just use simple cell phone tech to fix trains. Here’s the press release, I’m not sure what US Lighting Group has to do with this but they’re probably associated with Intellitronix. Alternately, it’s fake, which is entirely possible with all press releases and Kickstarter projects. Developers from Cleveland create software for a service robot, so that he recognizes the weapon from passing by and warns shooting in schools. If the robot sees the weapon, it alerts and sends notifications to the police and parents. While the weapons from the robot can be hidden, but by the end of the year the developers are going to equip the system with an infrared camera to increase the degree of threat recognition. Intellitronix is ​​engaged in the production of LED gauges for vehicles, but has now turned its attention to the sphere of robotics. And one of their first projects was the development of a solution that ensures the safety of children in school. It is implemented on the basis of the robot Promobot V.4. Negotiations are currently under way with individual educational institutions in the United States. 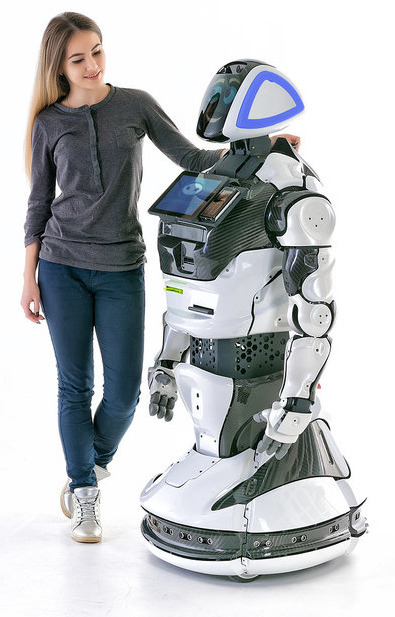 In addition to identifying threats, the robot can be in demand in the educational process, because it is able to build communication and maintain a dialogue. One robot costs about 50,000 dollars. However, Spivak argues that this is not so expensive for educational institutions, because many already pay for the curriculum that will be provided. Also they hope to attract sponsors. The company is considering the possibility of future deployment of the robot in the medical field, where he will diagnose patients and even measure their blood pressure. US Lighting Group is an industry-leading manufacturer of LED light bulbs. Our patent-pending driverless and transformerless technology allow our LED lights to offer maximum efficiency and an unmatched 21-year warranty. Every light is made, start to finish, in our facility located just outside of Cleveland, Ohio. Promobot, LLC is a manufacturer of autonomous service business robots with development centers in Europe and Asia and central offices in the United States and Eastern Europe. Several hundred Promobot robots operate in 25 countries around the world. They are used as consultants, building managers, guides, administrators. They are able to customize to the objectives of a particular business and improve the financial performance of companies, the quality of service and customer loyalty.